Princess Warrior commenced her run midway around the far turn and edged past Cool Beans inside the final furlong to win Saturday’s 28th running of the $200,000 Mrs. Revere (Grade II) at Churchill Downs by one length over a surging Get Explicit. Owned by Evan, Matthew and Andrew Trommer, Princess Warrior ran 1 1/16 miles in 1:47.61 over a Matt Winn Turf Course rated “yielding” to collect her first stakes win. Brian Hernandez Jr. rode the winner for trainer Kenny McPeek. 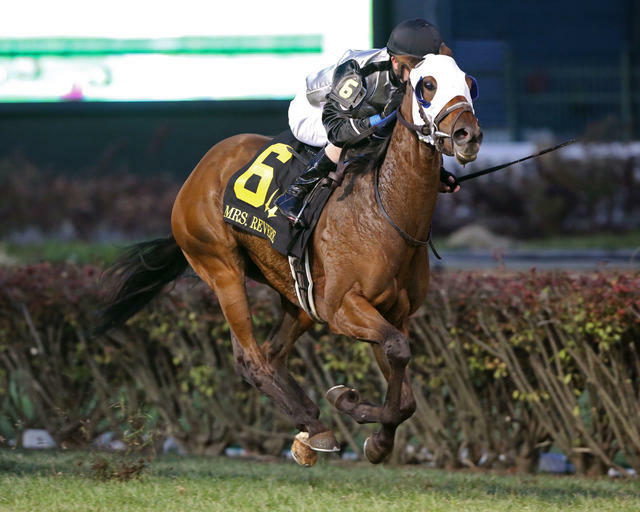 Princess Warrior, who previously finished fourth in the $500,000 Queen Elizabeth II Challenge Cup at Keeneland, banked the $117,800 first prize and rewarded her backers with $2 mutuels of $24.60, $8 and $4.80 as the 11-1 fifth betting choice in the field of 10 3-year-old fillies. Longshot Arabella Bella broke fastest of all and ran the first quarter mile in :24.43 before Cool Beans took over down the backstretch through a half-mile in :50.01 and six furlongs in 1:15.83. Princess Warrior was well positioned in the clear on the outside while racing near the back of the pack. She initiated her winning move around the turn with a four-wide rally, drew within striking distance at the top of the stretch and proved to be best down the stretch while holding off a late run from Get Explicit. Runner-up Get Explicit, under Ricardo Santana Jr., paid $9.80 and $5.80. Cool Beans, ridden by Florent Geroux, was another two lengths back in third and paid $4 to show. Kabella was fourth and was followed by 1-2 betting favorite Sella di Camelot (IRE), Lessons From Avery, Angel of Mischief, Dark Artist, Divine Queen and Arabella Bella. High Tech and Over Thinking were scratched. The winner’s share of the purse pushed Princess Warrior’s earnings to $410,741 from a record of 3-3-2 in 14 starts. Princess Warrior is a bay daughter of Midshipman out of the Consolidator mare Sessa who was bred in Kentucky by George M. Veloudis Jr. The Mrs. Revere is named in honor of Mrs. Revere, an accomplished Churchill Downs fan favorite in the mid-1980s. Mrs. Revere won 12 races in 28 starts, finished second seven times and earned $429,545 for Hall of Fame trainer Bill Mott. Her six wins in a dozen starts at Churchill Downs included stakes triumphs in the Regret, Dogwood and Edgewood in 1984 and the Kentucky Cardinal in 1985. She was owned by Drs. David Richardson and Hiram Polk, who have provided the winner’s trophy for the Mrs. Revere in each year of its existence.